Elena Kagan's Supreme Court Nomination Get full coverage of President Obama's choice for the 112th justice on the U.S. Supreme Court. 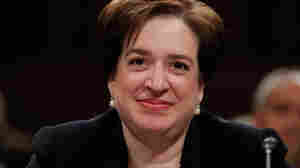 If she is confirmed, Elena Kagan, 50, would be the youngest member of the current court and her presence would result in three female justices on the nine-member court for the first time in its history. Get full coverage of President Obama's choice for the 112th justice on the U.S. Supreme Court. August 7, 2010  She becomes the 112th justice and the fourth woman ever to serve on the Supreme Court. Chief Justice John Roberts administered the oath to Kagan in a ceremony at the court. August 5, 2010  That a former U.S. solicitor general and dean of Harvard Law School would attract just five votes from 41 GOP senators underscores just how much the wrangling over federal court vacancies has come to reflect the nation’s growing political divide. July 20, 2010  The Senate Judiciary Committee has voted to approve the nomination of Elena Kagan to the Supreme Court. The 13-6 vote sends Kagan's nomination to the full Senate. 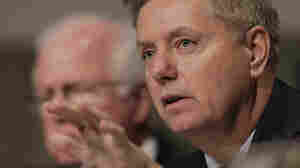 Lindsey Graham was the only Republican on the panel to vote in favor of Kagan. July 20, 2010  The Senate Judiciary Committee vote on Elena Kagan for the Supreme Court fell on strict party lines ... except for Sen. Lindsey Graham. The South Carolina Republican voted in her favor. July 16, 2010  Because Democrats hold a Senate majority, there is little doubt Supreme Court nominee Elena Kagan will be confirmed. But the Republican leadership, and some outside groups, are pushing hard to raise the number of 'no' votes. July 3, 2010  In between arguing about the commerce clause and explaining the meaning of interlocutory appeal, Supreme Court nominee Elena Kagan delivered some very funny lines over 17 hours in a Senate hearing room. 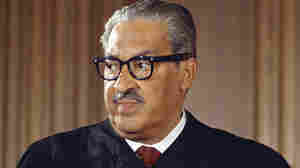 July 2, 2010  Elena Kagan's stated admiration for Thurgood Marshall, the Supreme Court justice she once clerked for, became the focus of much scrutiny during her confirmation hearings. Marshall's son talks about the late justice's true legacy, and his relationship with Kagan. July 1, 2010  On the fourth day of the confirmation hearings for Supreme Court nominee Elena Kagan, get up-to-the-minute analysis. 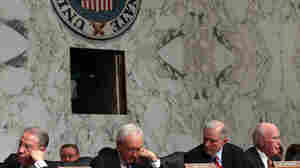 June 30, 2010  ANALYSIS: Other news has overshadowed the confirmation hearings, and a Democratic majority in the Senate has made the outcome seem almost predetermined. June 30, 2010  Supreme Court nominee Elena Kagan endured close to nine hours of questioning from senators on Tuesday. And Wednesday, she returned to the witness chair for more. June 30, 2010  Senators have spent two days confronting nominee Elena Kagan with questions about abortion, gun rights and presidential power. But while she may not get their votes, even Republican leaders say it seems likely she will make it to the Supreme Court. June 30, 2010  Get up-to-the-minute analysis as senators quiz Elena Kagan on her views during the third day of her Senate confirmation hearings. 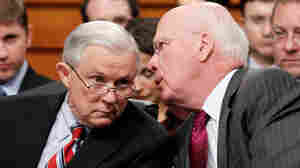 June 29, 2010  On the second day of Elena Kagan's Supreme Court confirmation hearing, Sen. Jeff Sessions of Alabama stuck to combative questioning while other Republicans remained tepid. Though Kagan did not fully reach the level of meaningful engagement she called for in an article 15 years ago, she did reveal some insights. 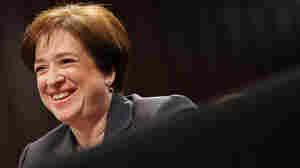 June 29, 2010  Elena Kagan's treatment of military recruiters at Harvard Law School took center stage Tuesday on her second day of confirmation hearings to serve on the U.S. Supreme Court. 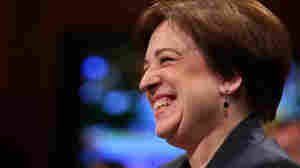 In tones at times emotional and steely, Kagan defended her record as a Harvard dean, even when challenged by Sen. Jeff Sessions.